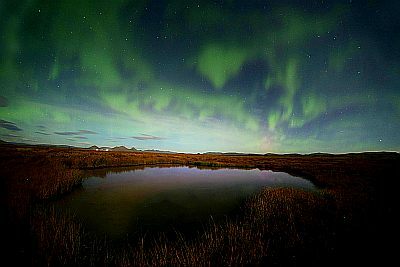 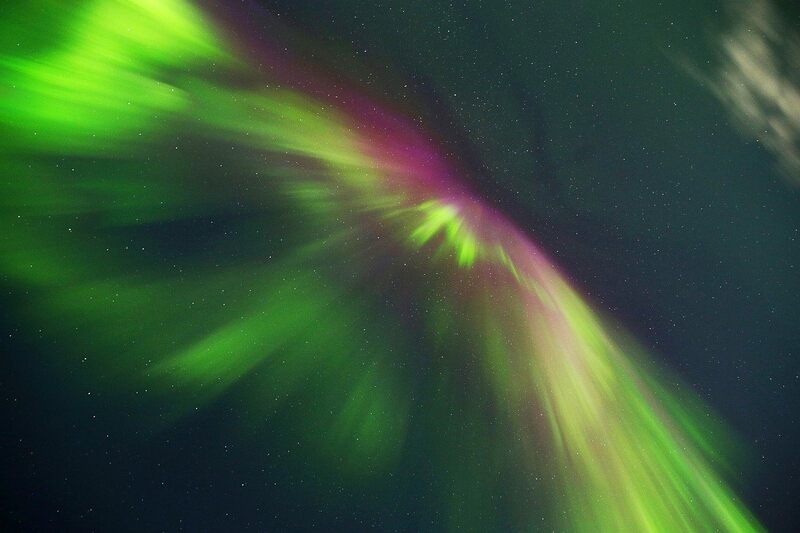 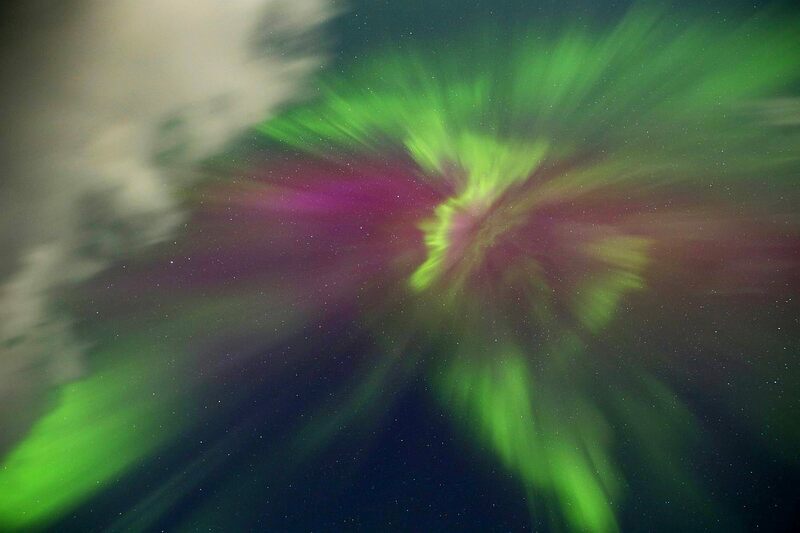 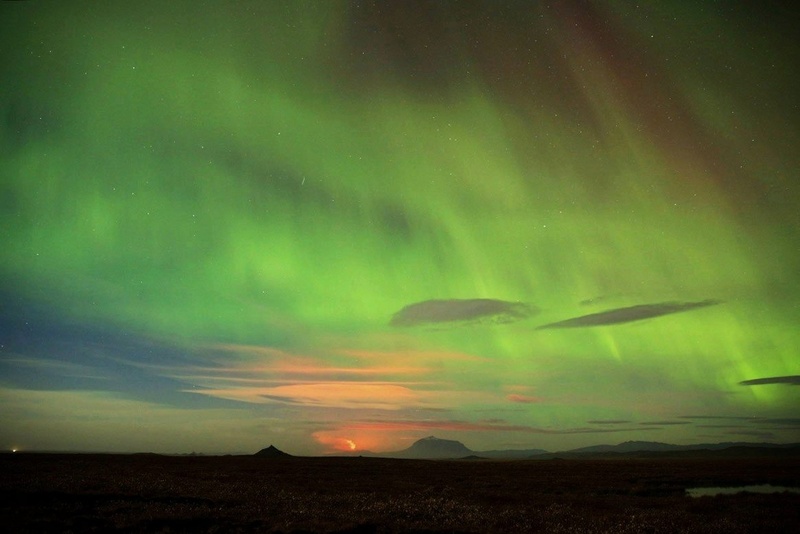 Bárðarbunga/Holuhraun, Fissure eruption, Aurora Borealis incl. 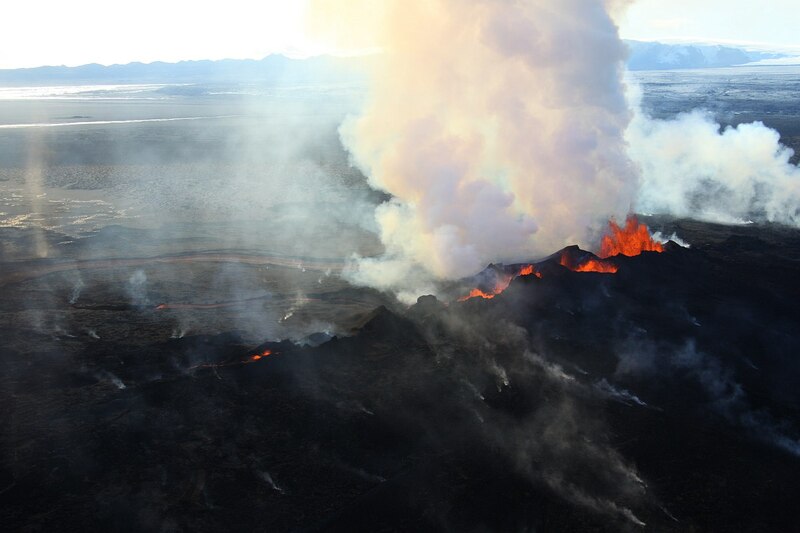 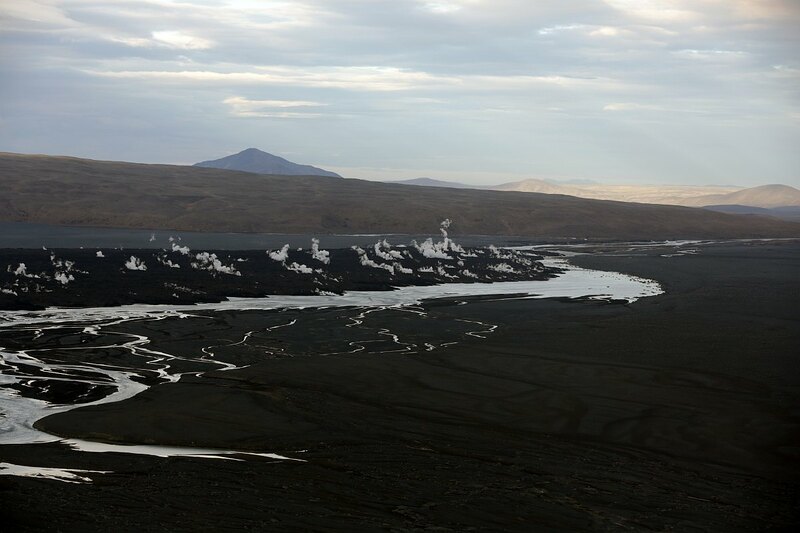 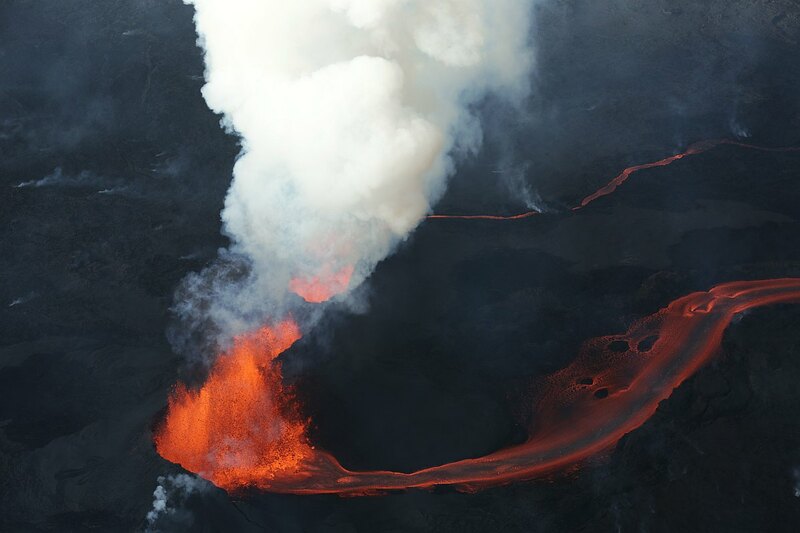 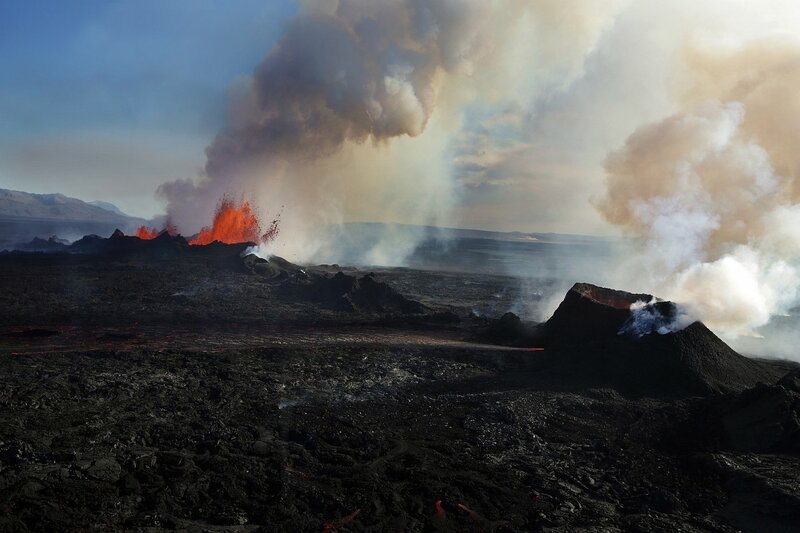 Although the Holuhraun plain was observed from Marc and Martin in a time of one week till the first eruption occured on August the 23rd, the first try to catch the eruptive fissure still active failed due to the bad weather conditions. 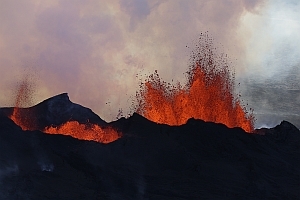 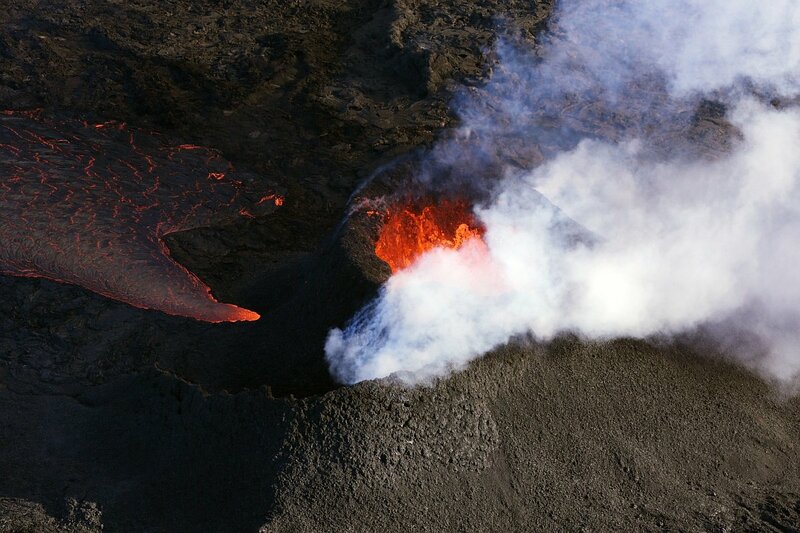 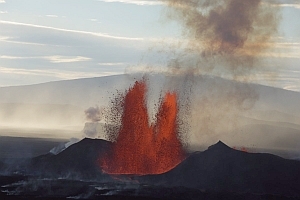 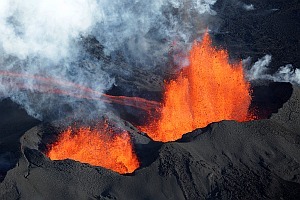 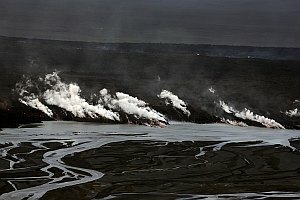 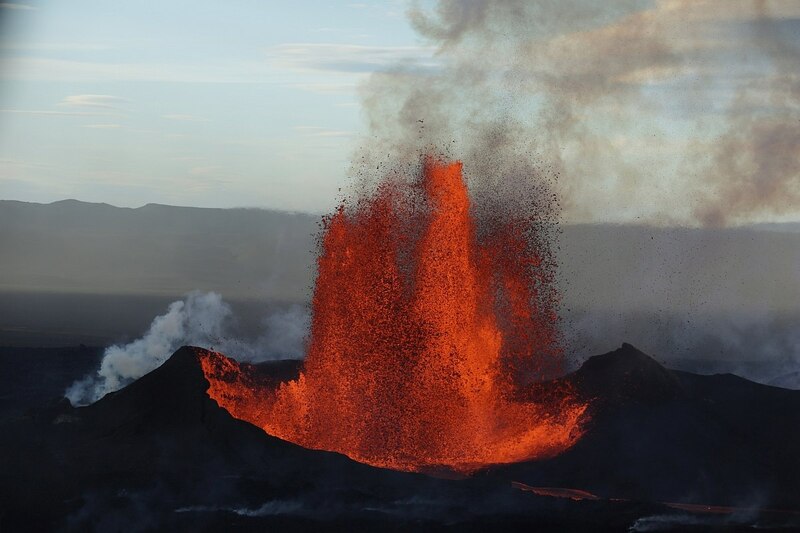 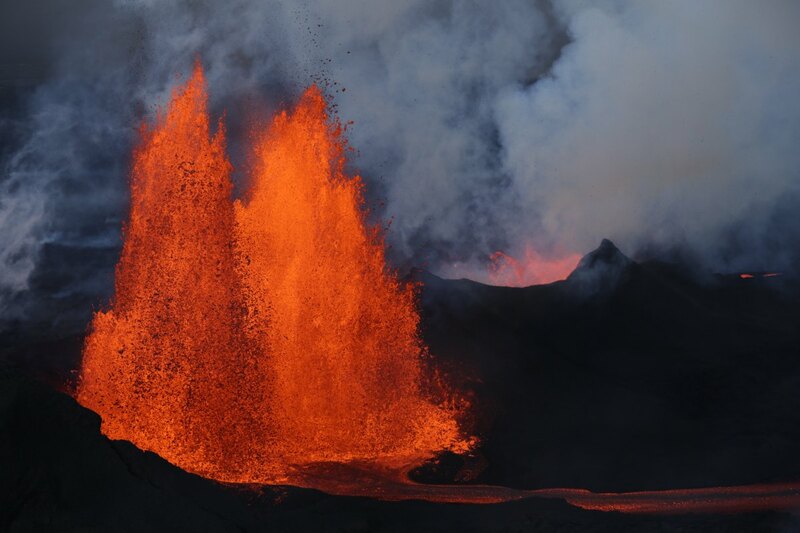 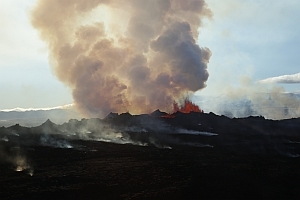 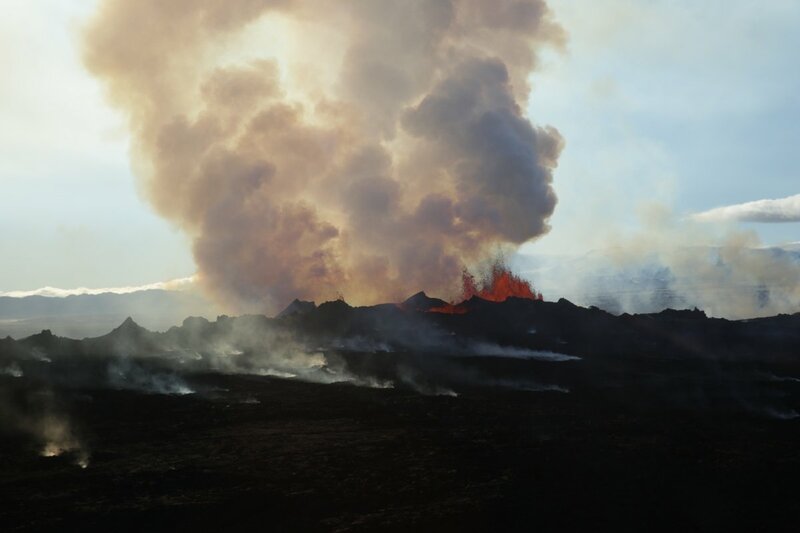 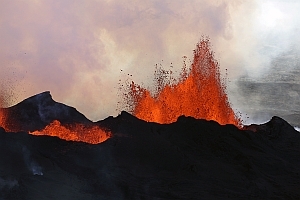 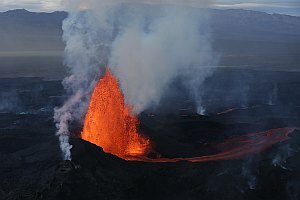 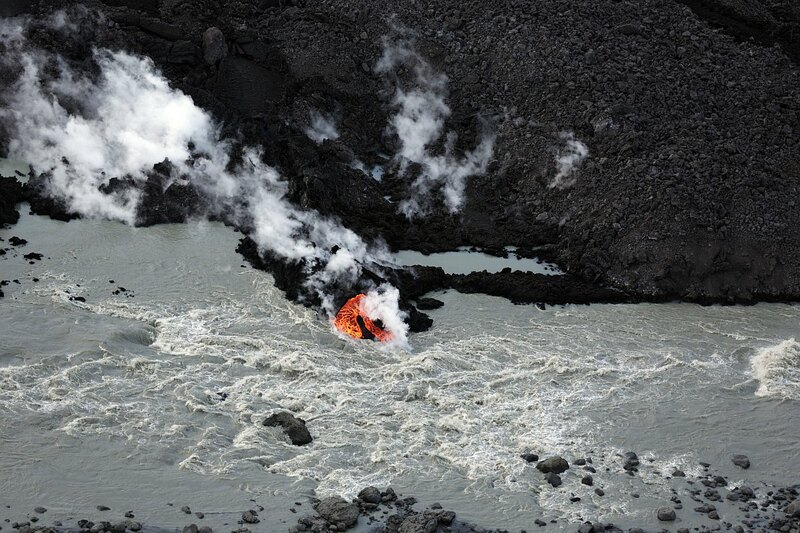 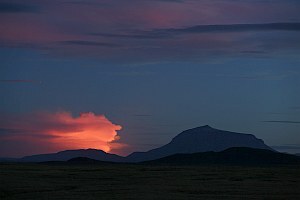 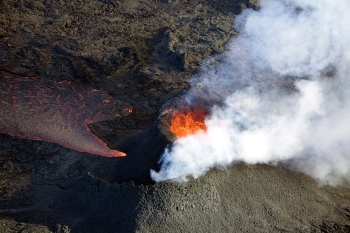 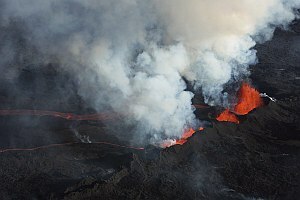 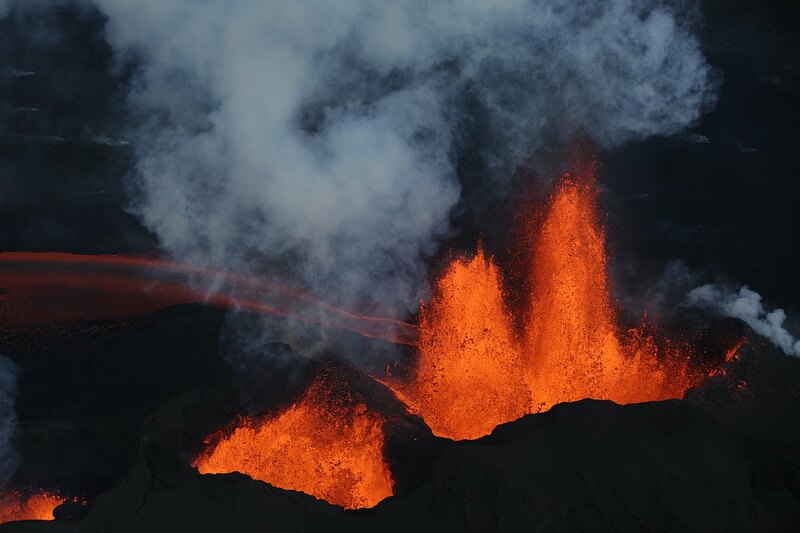 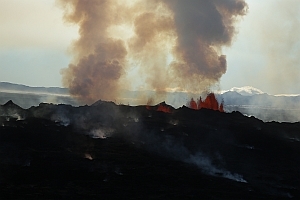 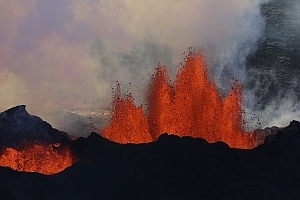 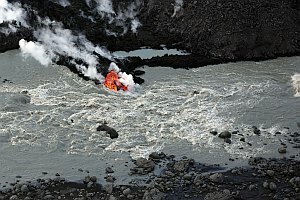 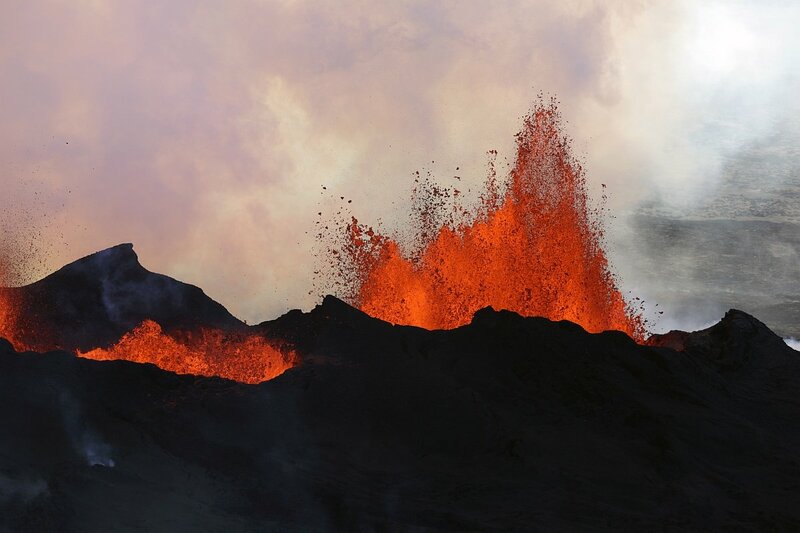 The action was almost not feasible, because already mentioned on Saturday August the 23rd, four km north of the glacier Vatnajökull the fissure opened in the early morning hours with a strong lava discharge. 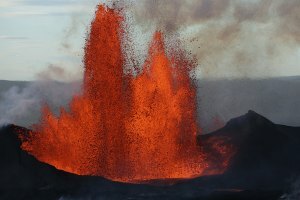 This eruption lasted only about 3-4 hours. 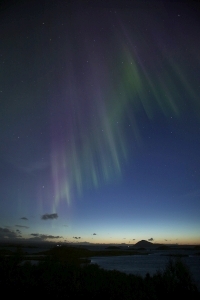 (to perform magic does not work at all). 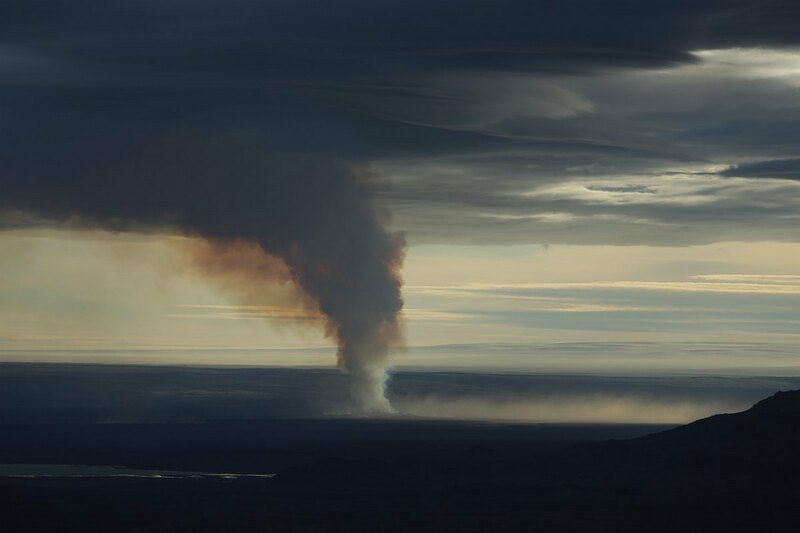 Marc ventured on Sunday a flyover, while only observing the cooled down and steaming fissure ( images / report above). 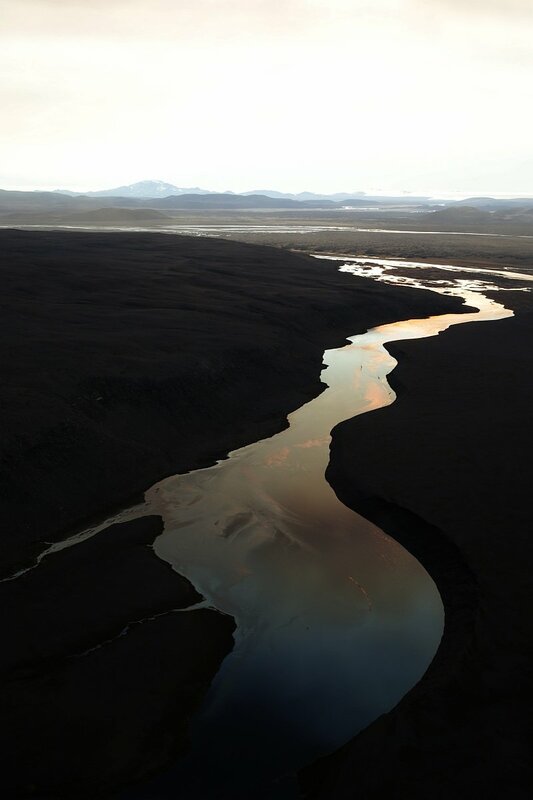 Already at that time the roads were closed due to flooding risk of the marsh area due to subglacial warming. 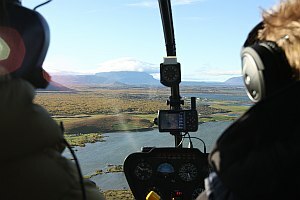 Why ? 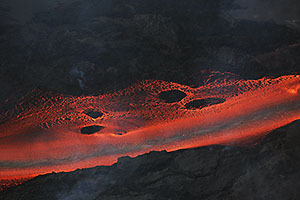 Also the main volcano Bardabunga was heated. 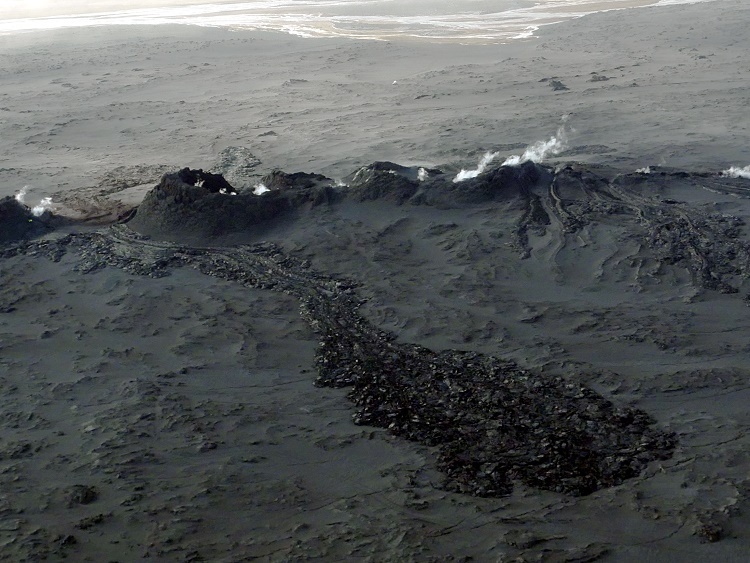 The ice cap subsidenced noticeable in the crater area of Bardarbunga, where the melt water has gone is thitherto completely unknown. 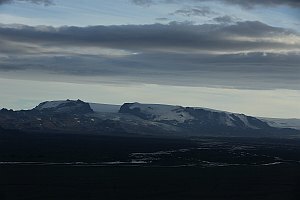 May a huge water reservoir below the 400m mighty ice layer has originated, and if the locks get opened under the glacier a colossal ice flood would be the episode. Thus, there would be no chance on the ground to escape only four kilometers from the edge of the glacier. On August the 29th a new step of escalation followed. Many earthquakes in this area had already announced this advance of the activity. 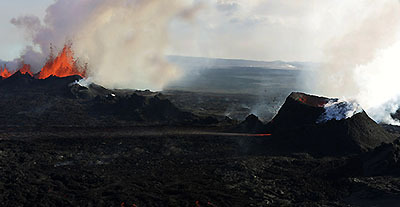 The southern lain big cauldron was on the 11th still activ. 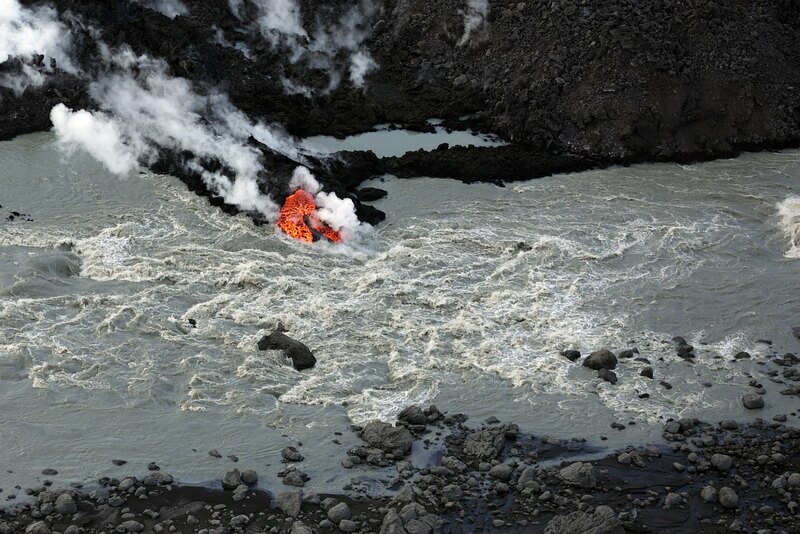 On the 13th of September this pot was not active any more. 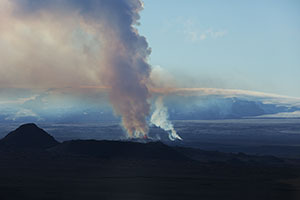 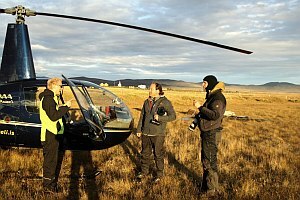 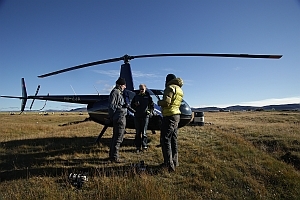 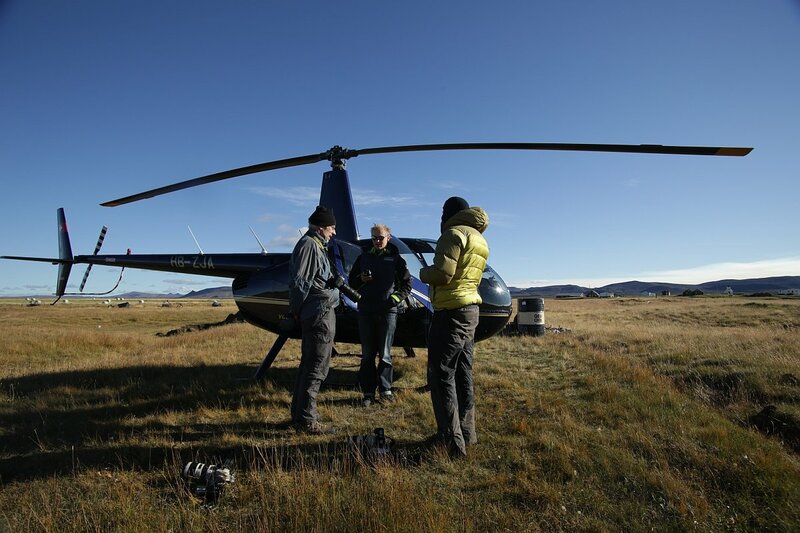 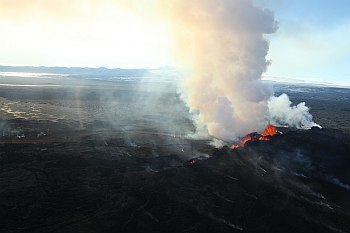 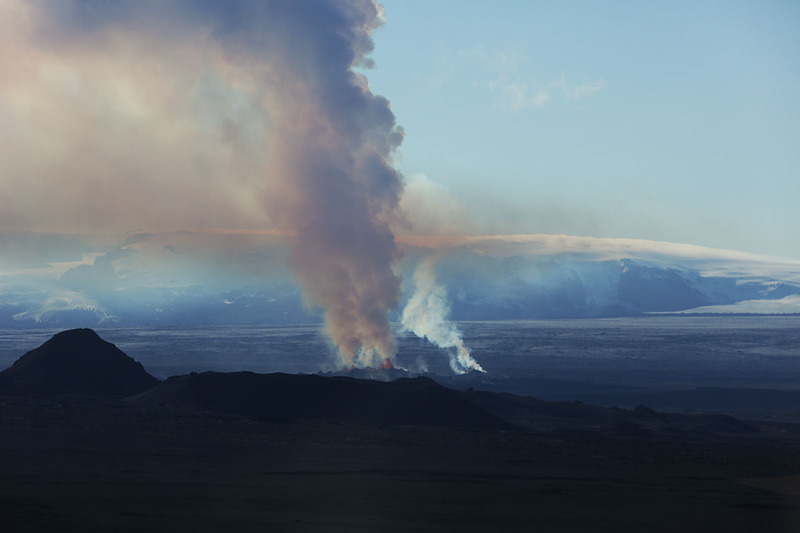 The second helicopter flight to Holuhraun plain to the eruption site. Right: A sand storm irritated or shocked us well. A number of previous flights had to be canceled to the fissure because of poor visibility. 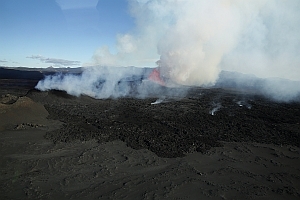 Coming closer, it seemed to be a clear view at all because the border area doesn't annexed the eruption area. Why just this small area was a sand storm focus could no one tell us. 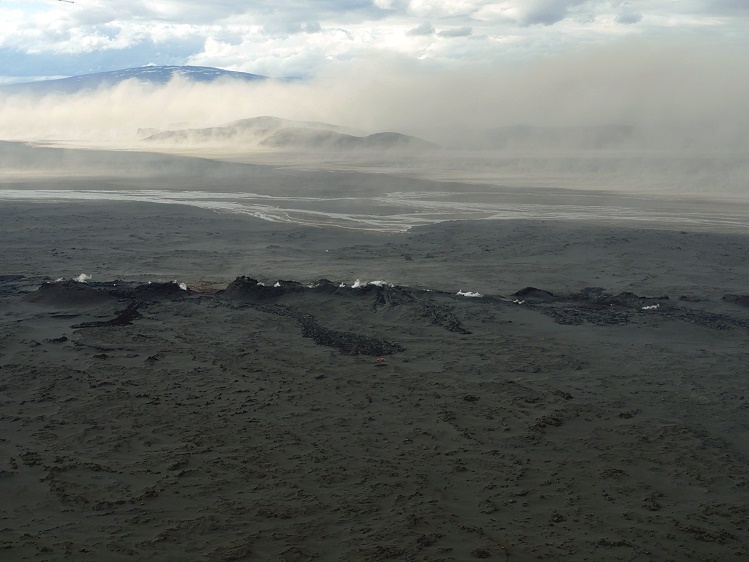 Perhaps it was due to local soil deposits which have been sighted in this area often. At the beginning a spilling gap like an open wound in the island of Iceland was prevailing the lanscape, but from the first day ca. 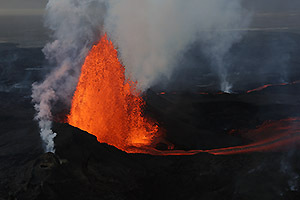 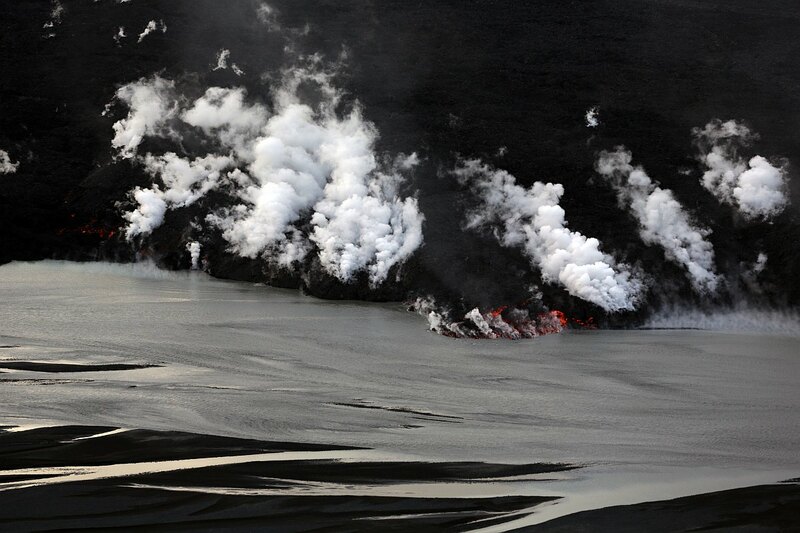 50-100m high lava fountains originated ​​within 10 days an imposing crater populated volcanic landscape. 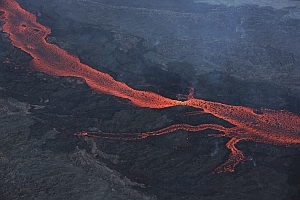 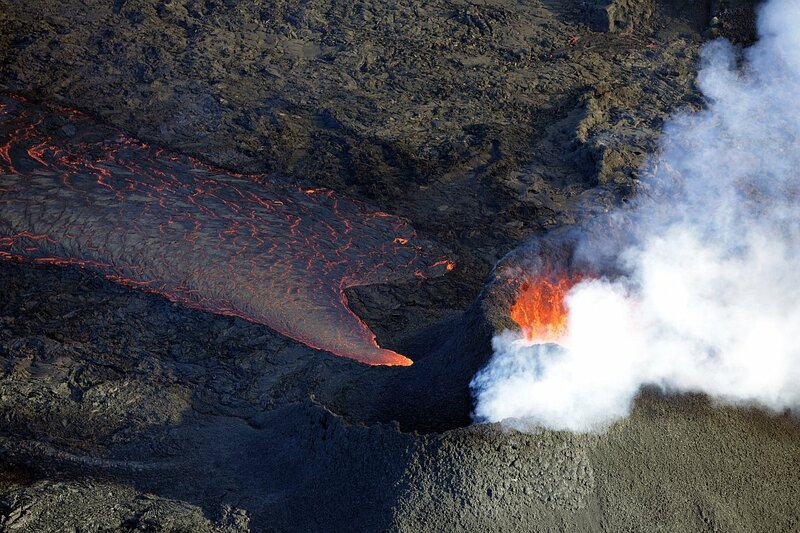 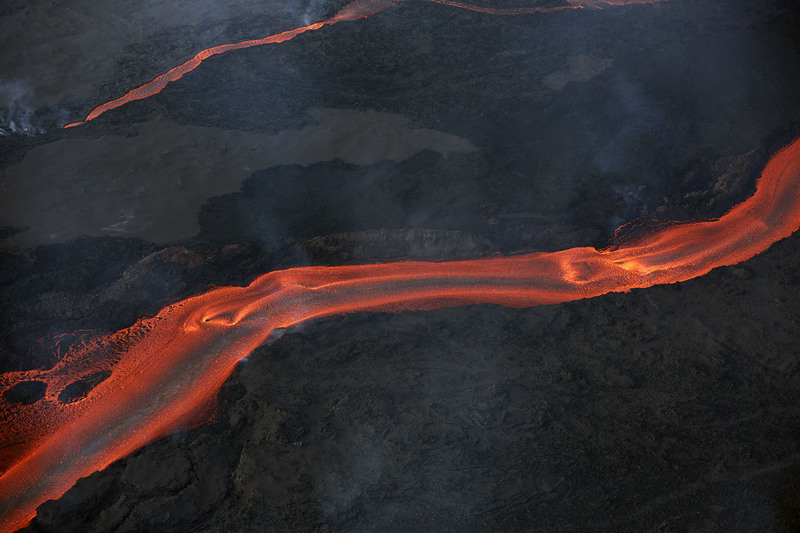 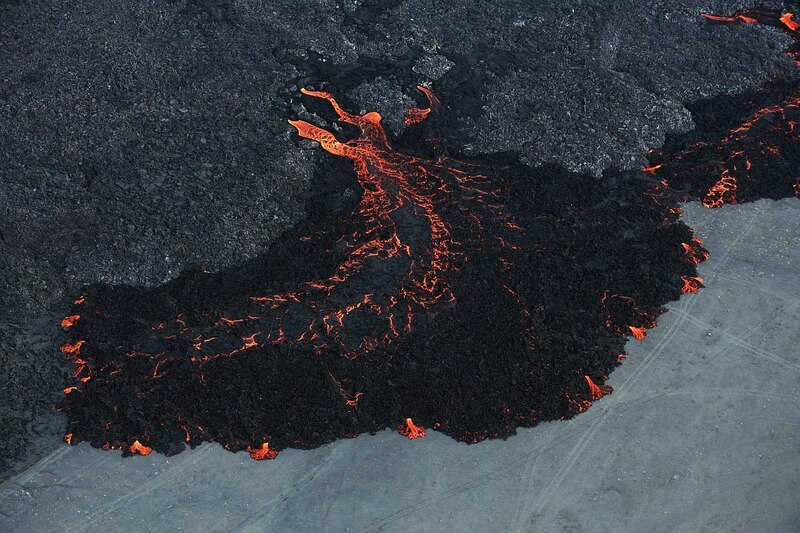 The classic shape, a lava blooding fissure seemed to be gone actually, and this was initially the reason not to fly. But as you can see on the photographs we got surprised by high fountains up to 100m -130m (estimation very difficult) while the smaller active cauldrons found itselves on a string of pearls. 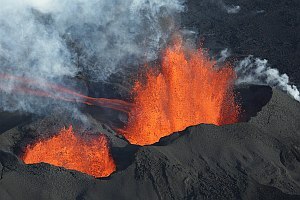 Here it was again, this fissure similar sight and impression. Lava flow about 6 kilometers from the fissure.The fresh subterrain lava runs by so-called tubes of several hundred meters in length to the next way into open terrain. 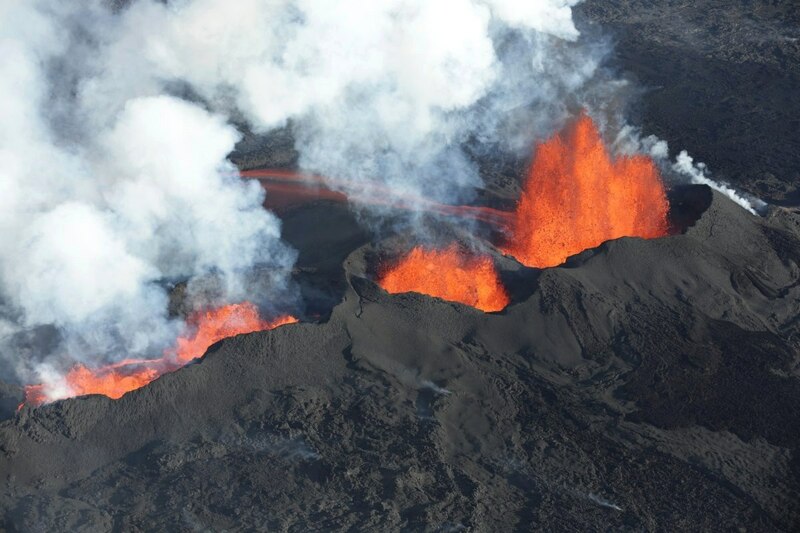 The lava field beginning from the Holuhraun eruption is now advanced ca. 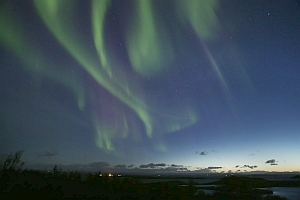 20 Km in northern direction. 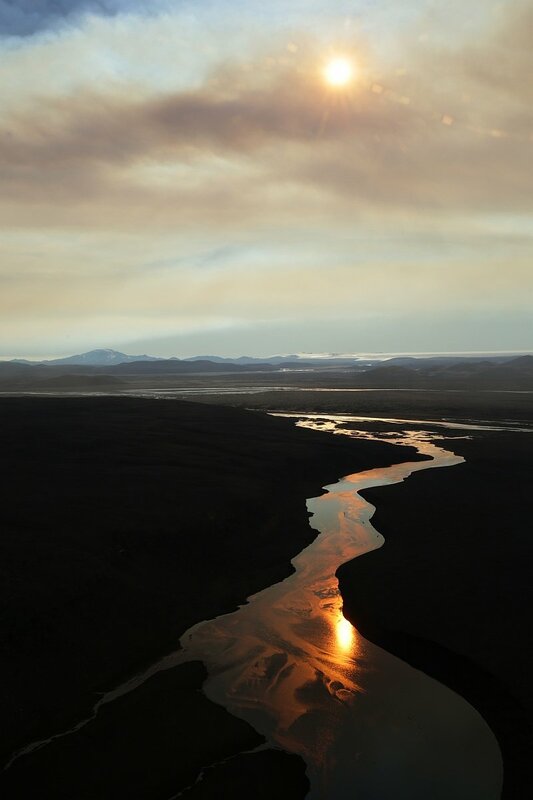 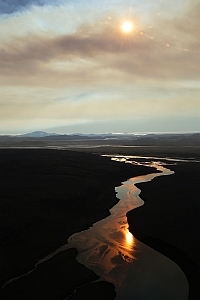 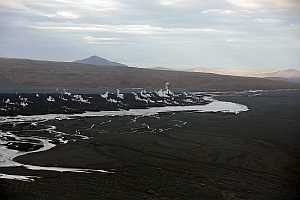 Here the lava approaches the western lain branch of the Jokulsa a Fjollum glacial river which has its source from the outlet of the Dyngjujökull glacier. 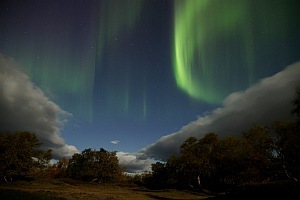 Strong polar light sparkling verticaly down to us, wow! 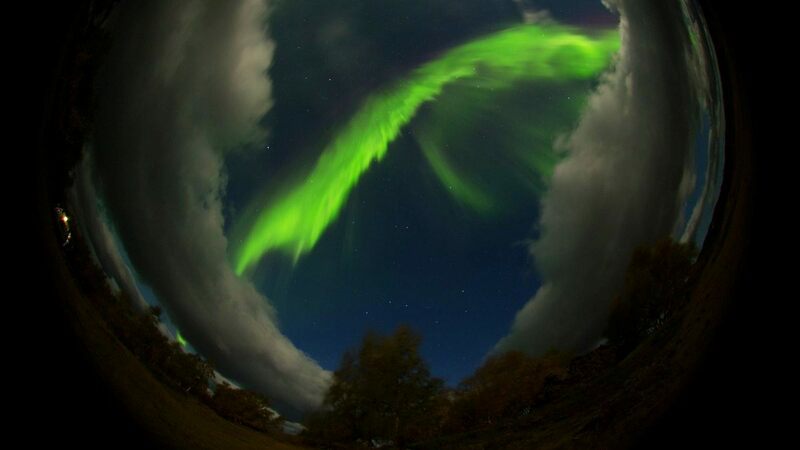 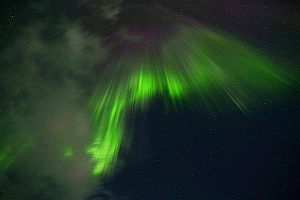 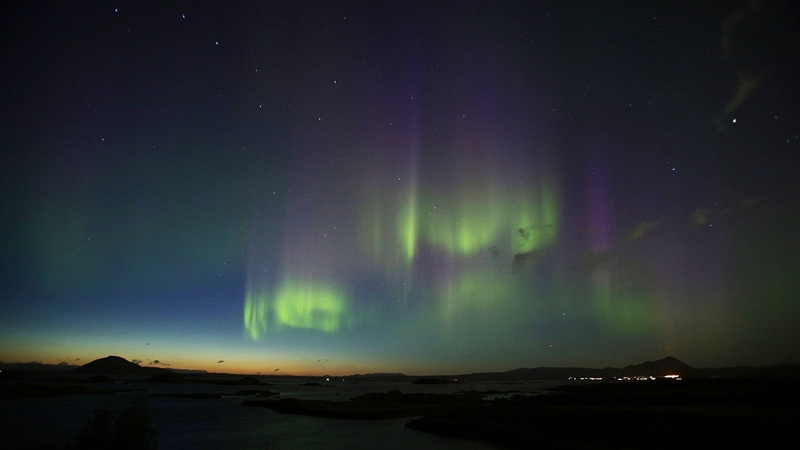 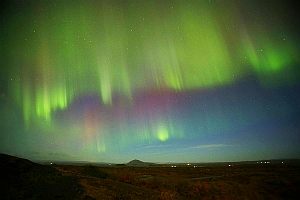 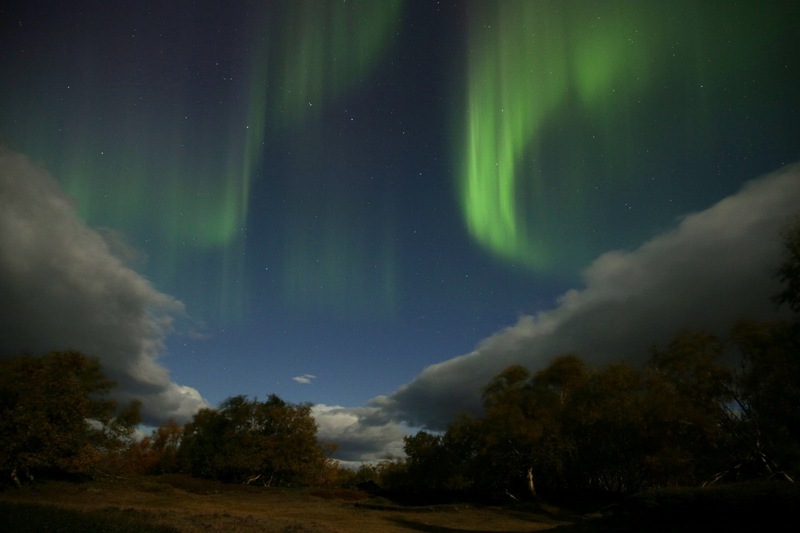 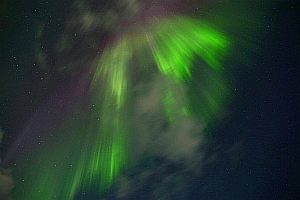 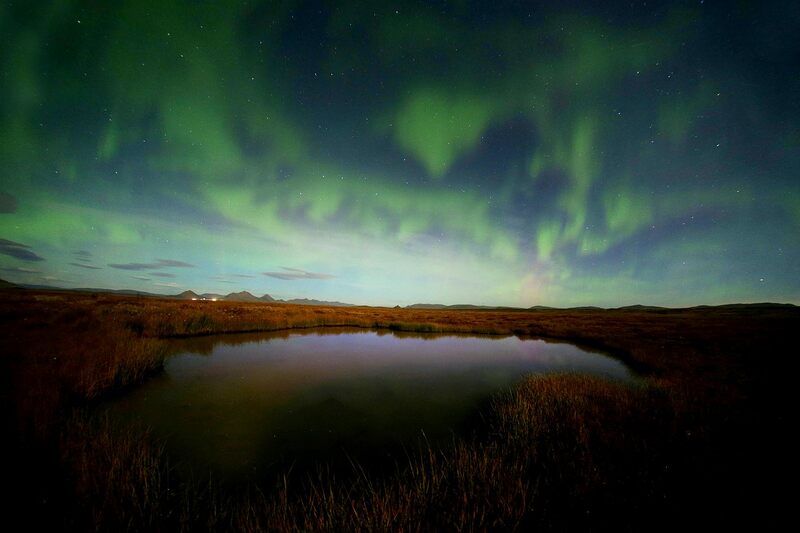 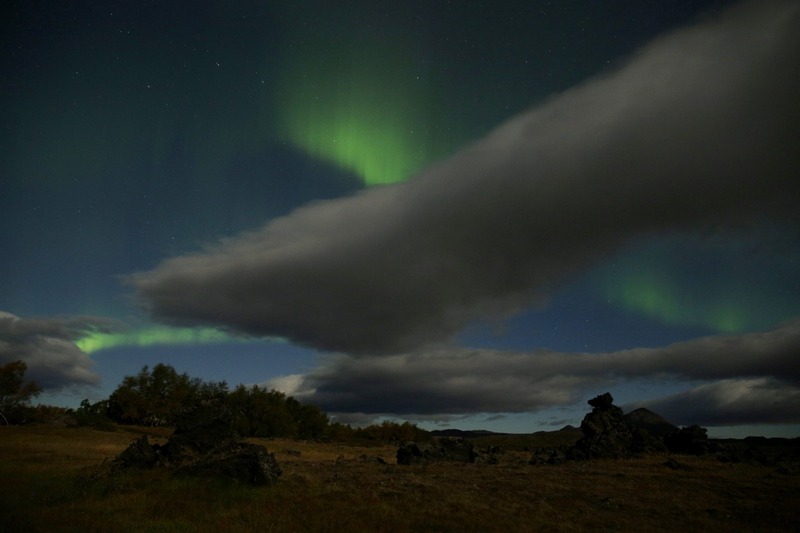 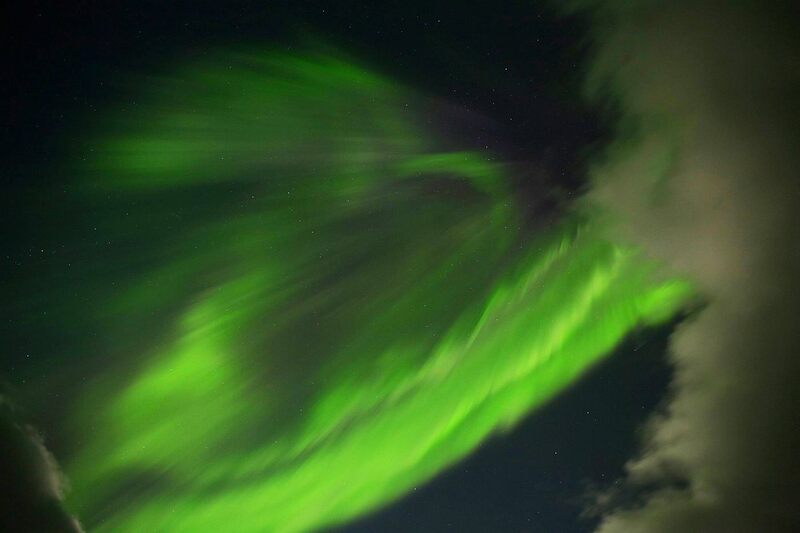 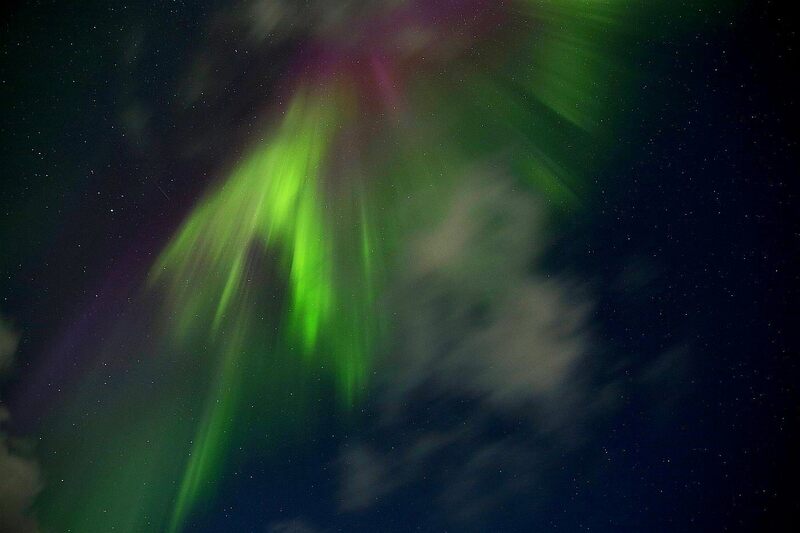 Polar lights like in 'Lord of the Rings' fascinated the whole nights. 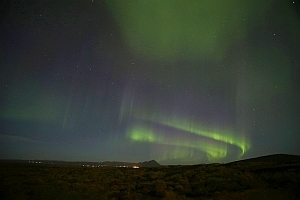 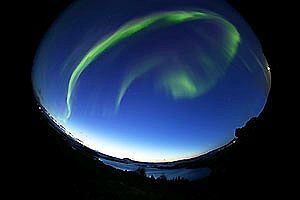 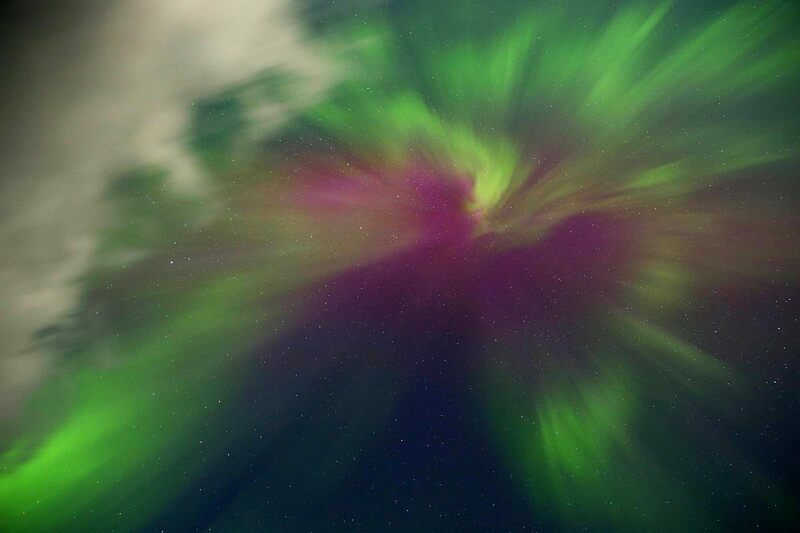 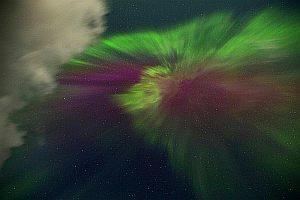 Did this auroral action occurred in the night of 10-11. 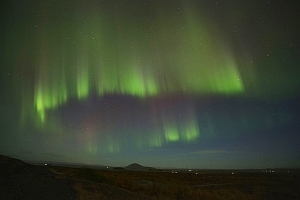 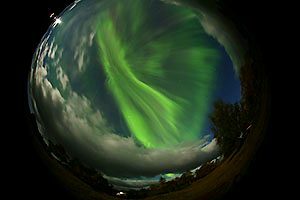 September surprisingly, the polar lights during the 13-14th were an announced sky spectacle. 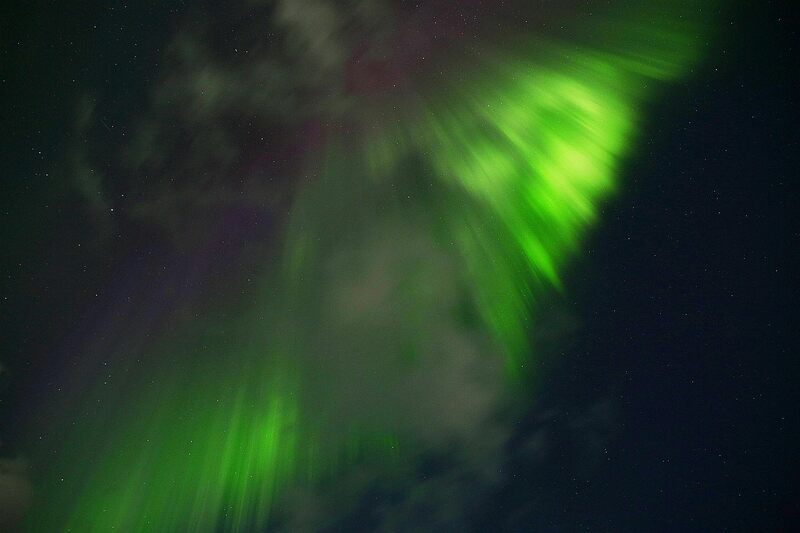 However, strong but bizarre forms of polar lights on September the 13th at apprx. 21:00h over the crater lake Mývatn. The twilight gave these auroras the subtle nuance.